Mini CW/CCW Propeller w/ 2pcs Prop Guard for RC Quadcopter Helicopter Parts by uptogethertek at Open Drone. Hurry! Limited time offer. Offer valid only while supplies last. This is a professional set of rc quadcopter spare parts, which includes 16 pieces cw ccw propellers and 2 pieces propeller protective guards. - high quality and brand new. 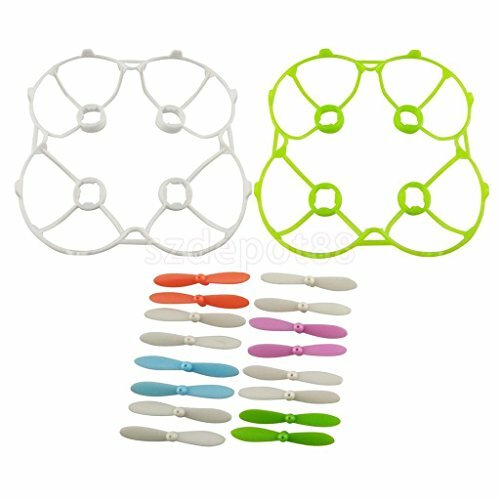 Made of durable hard plastic material, great for replacing the old or broken propellers and propeller guards. - portable, easy to install. - suitable for cx-10 rc quadcopter helicopter parts. Package includes: 8 pieces cw propellers 8 pieces ccw propellers 2 piece propeller guards.